Are you a fan of hunting escapades? Do you experience difficulties achieving great accuracy and precision in your distant shots and want to measure distances perfectly? 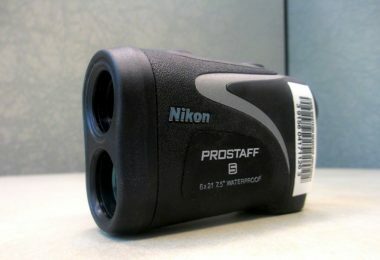 If yes, consider trying out the Nikon ProStaff 3 Laser Rangefinder. For any hunter or target shooter, getting accurate shots is immensely satisfying. Rangefinders are perhaps one of the most important hunting gears. They speed up play by calculating distances in seconds, compensate for any slopes or elevation in your site and overall boost your confidence. This is why finding the perfect rangefinder that performs exceptionally is of immense importance. 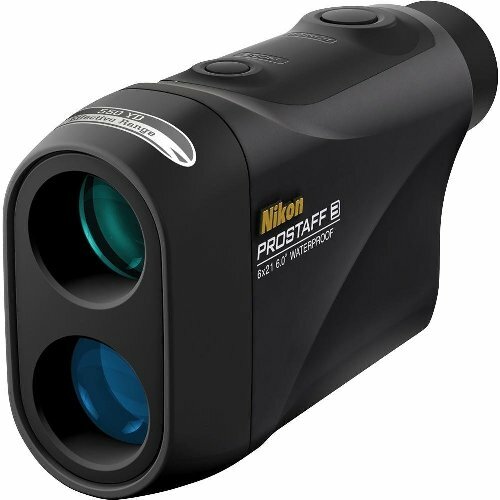 The Nikon Prostaff 3 is the latest addition to the legendary sports optics from Nikon. It is a pocket-sized tool that is built for great precision, good speed and shot consistency up to 550 yards. It comes with a perfect size and satisfying profile for any hunting situation. Since basic rangefinder features are the differentiating factors among the myriad of finders, we’ve found it wise to highlight some of the intriguing features of this rangefinder in the review below. Read on to know if it can be your rangefinder of choice. 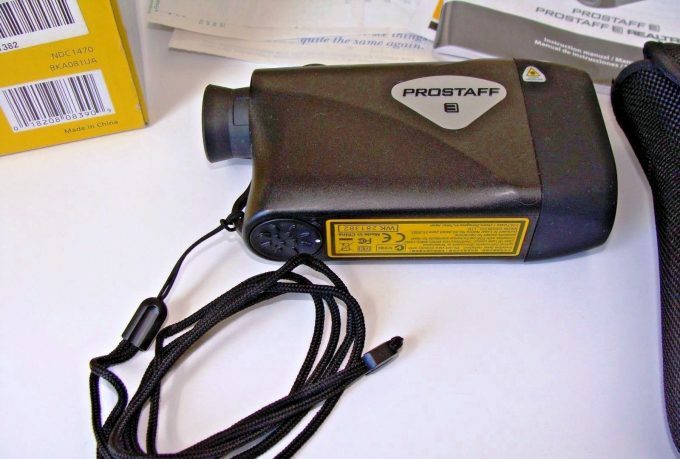 The Prostaff 3 laser rangefinder is tagged as an ideal rangefinder for any serious hunter. This is perhaps based on the features of this item. Some of the outstanding features that make this a better rangefinder are highlighted below. You can decipher a lot by looking at the packaging of any product. Ranging from its ease of use, quality usage, portability and even durability, all these can be read by how a product is presented. This is why Nikon doesn’t make mistakes when undertaking this. Nikon Prostaff 3 is delivered in a nice package. Besides, unlike other rangefinders on the market of the same price range, this product, and other Nikon rangefinders, comes with a battery in-situ. That spares you the trouble to buy a separate battery that is an additional cost. Other items in the package include a user manual to help you learn how to use this product easily. Nikon also includes a soft case here to provide an easy storage and a neck lanyard to make it easier to wear. This is perhaps what many hunting enthusiasts consider when searching for hunting gears. You definitely don’t want something that will break down within a short period, or give in to the tough abuse. This rangefinder tries to satisfy these conditions through its tough and durable build. The Prostaff features a hard, durable and rubberized casing which looks smooth and sleek but offers a nice grip. Confirming its sturdiness, a user attested that it survived an accidental drop from the table without any damage. Hunters who use glasses are also considered in the making of this model, as they can easily roll up the rubber eyepiece for easy viewing without necessarily removing the glasses. A longer battery life is all hunting aficionados need with any rangefinder. Otherwise, your distance precision experience will be cut short. Nikon, being among the best brand, gives their customers some piece of mind in their rangefinder’s battery life. Though quite expensive, this rangefinder uses a CR2 lithium battery. This battery type is preferred by many rangefinders due to its lightweight nature and longevity. Nikon includes one battery in its package to get you started off. Removing and replacing the battery is also easy and can be done tool-free. Hunters are always on the move. Carrying along a hefty gear will compromise your flexibility, and Nikon understands this very well. Its ultra compact size can be judged through the dimensions of 5.1 x 2.7 x 1.5 inches and a weight of 6.3 ounces without batteries. 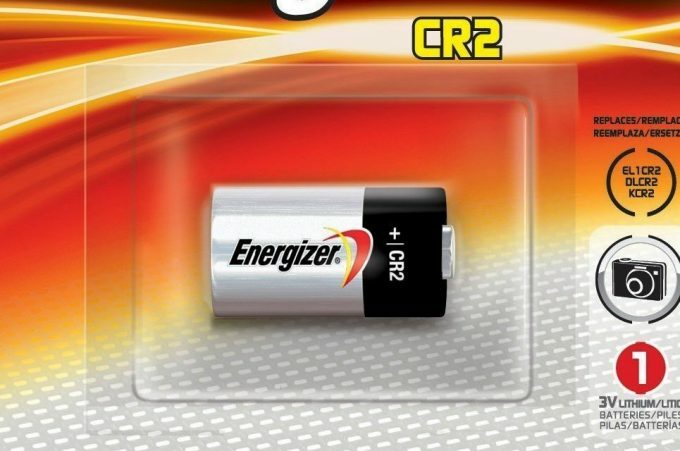 Remember they use CR2 batteries which are lightweight, and thus won’t add much weight. Rangefinders, as the name suggests, should be used to estimate distance. This should be the ultimate function of this product, and it ought to be determined easily. When it comes to ease of use in a rangefinder, you should easily view the targets and read distances. That said, this rangefinder comes with a single button operation ability. With this, only one touch button activation emits laser ranging. The device also shuts down if not used for 8 seconds thus saving battery life. Other features that make this rangefinder easy to use include the uncluttered LCD which provides for a fast and easy ranging even in bright light. It also features a Tru-Target technology ranging system which ascertains an accurate distant ranging in various hunting conditions and terrains. To begin, Nikon is a respected and well-known brand when it comes to the production of quality optics and exemplary imaging products. Despite their equipment being quite pricey, you are assured of value for your money. However, this may not apply to this rangefinder as it is affordable yet well-packaged. The cheap nature of this rangefinder doesn’t affect its quality. They certainly didn’t cut corners when designing this product. 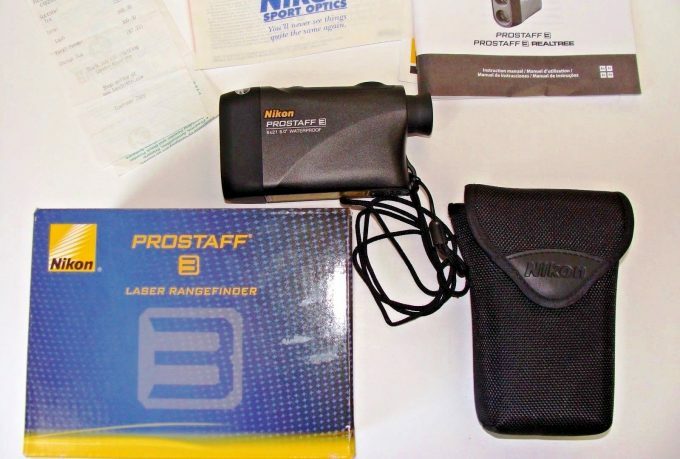 Retailing at approximately $180, Nikon Prostaff comes with great features, as outlined above, which cannot be found in rangefinders of this caliber. Getting a rangefinder with water resistant feature is overly important. Hunting is a cool outdoor activity for all weathers. However, this may not be possible if your rangefinder can’t withstand some light rain. Nikon Prostaff is made of a hard-rubberized body which is 100% water and fog proof. However, this doesn’t mean that you drown it in a pool of water. Some components, such as the battery component, aren’t covered by the rubberized casing, which would make switching the battery really easy. Therefore, exposing such sensitive parts to water may damage the finder. Always watch out! A rangefinders optic system dictates a lot concerning the device’s functionality. For sure, any rangefinder with a poor optic system will frustrate your ranging efforts. As mentioned earlier, Nikon is known to be the best when it comes to this segment. Bearing this in mind, the Nikon Prostaff comes with bright and 6x magnification optics system. These legendary optics come with a proprietary anti-reflective coating which provides high-end resolution in most conditions. It also measures ranges from 11 to 550 yards with 0.5 yards reading increments. 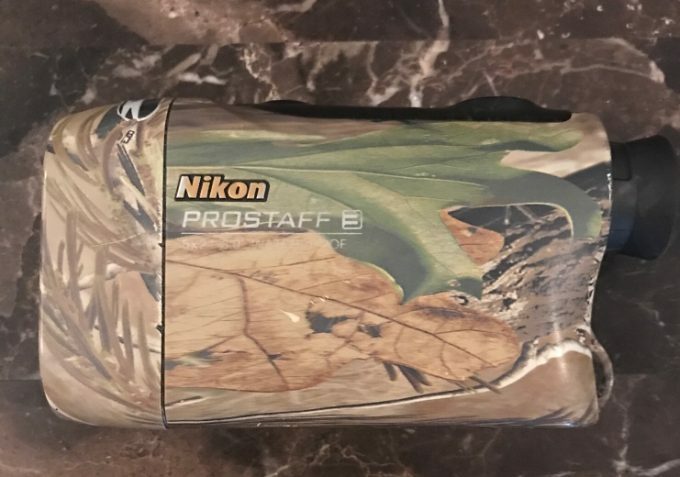 As mentioned before, there is a myriad of rangefinders present in the market currently, and Nikon Prostaff 3 is feature-packed yet affordable. 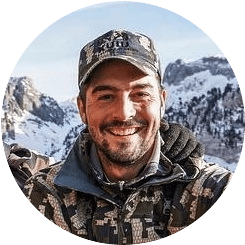 This calls for a clear-cut understanding of the individual features so as to find the most appropriate rangefinder for your hunting needs. Other rangefinders with more, less or similar features with this rangefinder include the following. 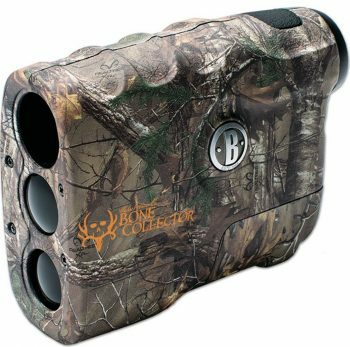 The Bushnell Bone Collector Edition 4x Laser Rangefinder is one of the Bushnell manufacturers products to cause ripples in the rangefinder market. 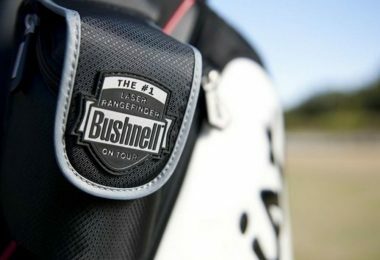 Bushnell is known to manufacture a number of rangefinders, with some being excellent and others mediocre. According to manufacturers and some users who have tried out this finder, they attest ranging up to 600 yards, for highly reflective targets. However, when it comes to trees, the rangefinder ranges out to 400 yards and 200 yards or less to a deer. The accuracy of this device is also just above average. There are many complaints about this range but is understandable because the retail listings of this rangefinder don’t provide for a full rundown of the maximum distance ranges. Nonetheless, our product of review is way better with a standard metered range of 550 yards. Ease of use is one of the crucial aspects of any rangefinder, and this finder comes with an intuitive menu and simple to operate with a one-button operation capability. From the display, you can see the battery indicator, distance in meters or yards and of course, an aiming reticle. 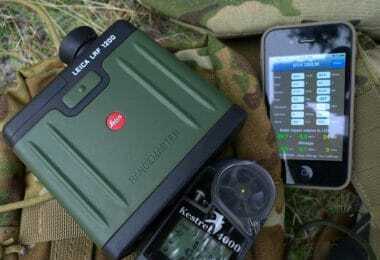 This device also focuses automatically, but there are quite a few bells and whistles of easy rangefinding. 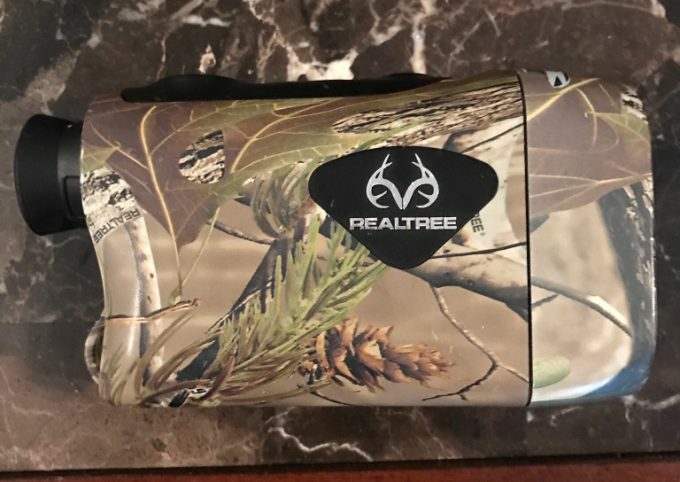 Moving on, unlike other rangefinders, including our product of review which is powered by CR2 batteries, the Bushnell Bone Collector Edition Laser Rangefinder doesn’t come with this battery. Instead, it is powered by an easy to find and cheap 9-volt battery. This device doesn’t consume much power, therefore, allows for thousands of readings from one battery. The rangefinder’s 9-volt battery fits snugly into the battery compartment. This makes it difficult to insert when changing or removing it. Besides, a rechargeable 9-volt battery may not fit the compartment. That said, our product of review seems superior to this because it is powered by a CR2 battery, which besides being expensive are lightweight and lasts long. The optics of the Bushnell rangefinders are quite impressive, but not as much. They include a fully multi-coated optics system with 4 x magnification power. Findings are displayed in an LCD which uses illuminated indicators to make reading easier even in low light conditions. This doesn’t compare with the Nikon Prostaff 6x magnification power. Other easily identifiable features of this rangefinder include a single button activation button which can be easily found even in low light, a RealTree Xtra camouflage finish, ergonomic finger indents for a secure grip and rainproof housing. Without forgetting, this finder automatically turns off after 30 seconds without use. These, compared to some of the features of our product, are seemingly average. 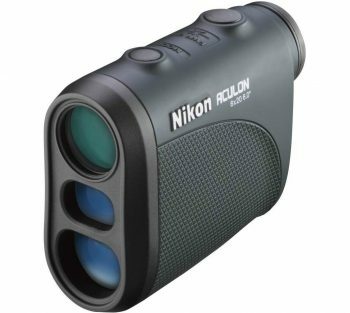 The Nikon 8397 ACULON AL11 Laser Rangefinder, a sister product to our rangefinder of review, is one worth watching especially for beginner shooting and hunting enthusiasts who are wary of the product’s price. To begin, this rangefinder is designed with ease of use in mind. Its compact design makes this product a practical choice for individuals who aren’t static. It is perhaps why many people refer to it as Nikon’s most compact laser rangefinder. Its lightweight makes it a perfect finder to carry along. Based on this compact nature, and its weight, falling at only 4.4 ounces, this rangefinder is a perfect measure of portability. It is pocket-friendly and perfectly fits in the user’s palm. That said, our product of review, the Nikon Prostaff feels inferior to this device, but that’s just but the weight, so let’s look at other features. This unit uses the powerful and hard to find CR2 batteries. Opening the battery compartment is also not difficult and doesn’t require special tools, which makes the whole process of swapping batteries quite easy, even in the field. Once powered on, it takes 8 seconds before automatically shutting down thus saving battery life. From this, the Nikon ACULON doesn’t differ much with the Nikon Prostaff. Being from the same company ascertains this consistency. With both sets, you won’t regret if you often forget to power down the rangefinder. This device optic system and ranging are outstanding. But so are those of the Nikon Prostaff. 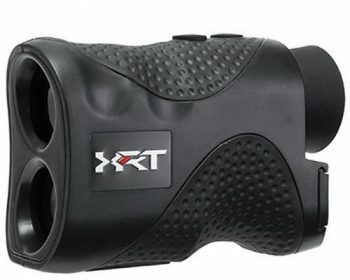 Just to mention, it features a 6x magnification, providing clear distance range of up to 550 yards, so there is no difference with the Prostaff. The distant target priority mode is yet another intriguing feature that accompanies the Nikon ACULON. With this feature, the rangefinder is programmed to automatically display the range/distance of the farthest target among a group of targets. This comes in handy when measuring distances in a bushy area or some terrain covered by grass. On the other hand, the Nikon Prostaff doesn’t feature such programming. It only displays the range automatically where you will be able to decipher the farthest distance from the LCD. Nonetheless, its display is clear, thanks to its high-end optics. Other similar features found in both rangefinders include durable casings which are waterproof, large, well-spaced and comfortable buttons, ability to display distance in both meters and yards and much more. That said, apart from the weight and distant target priority mode, our product of review compares equally well with this rangefinder. 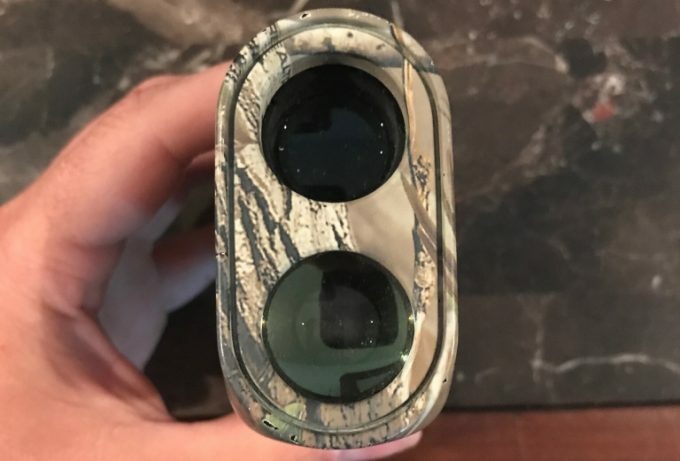 The Wildgame Innovations Halo XRT Rangefinder is yet another awesome rangefinder that ranks high on the affordability scale. Note that for any lowly priced device, there must be something that was sacrificed to achieve this. Let’s get to some features of this rangefinder to uncover this. To begin with ranging, this rangefinder comes with a stated range of 500 yards, and it is also claimed to magnify the images by 6x. According to manufacturers, this product’s accuracy is plus/minus one yard, but users who have tried this claimed that the finder accurately ranges up to 400 yards. This is somewhat low compared to the Nikon Prostaff which has a maximum range of 550 yards. Ease of use with this rangefinder seems above average. However, it lacks an automatic zoom button, unlike our product which automatically ranges. Nonetheless, the rangefinding buttons are easy to find and easily depressed. This makes it easy to focus and zoom for utmost accuracy. The optics of this rangefinder are also average. The Halo XRT rangefinder uses a black font on the LCD making it difficult to easily read the measurements. This can be worse especially in low light conditions when reading a black font is impossible. You will also have to make various readings to get an accurate estimate. A good feature we found in this rangefinder is the CR2 battery. This system is powered by the CR2 lithium battery, which besides being expensive, is lightweight and long-lasting. However, the rangefinder doesn’t automatically turn off so you will have to remember turning it off every time it isn’t in use. It also doesn’t come with the battery in-situ, thus an additional cost. 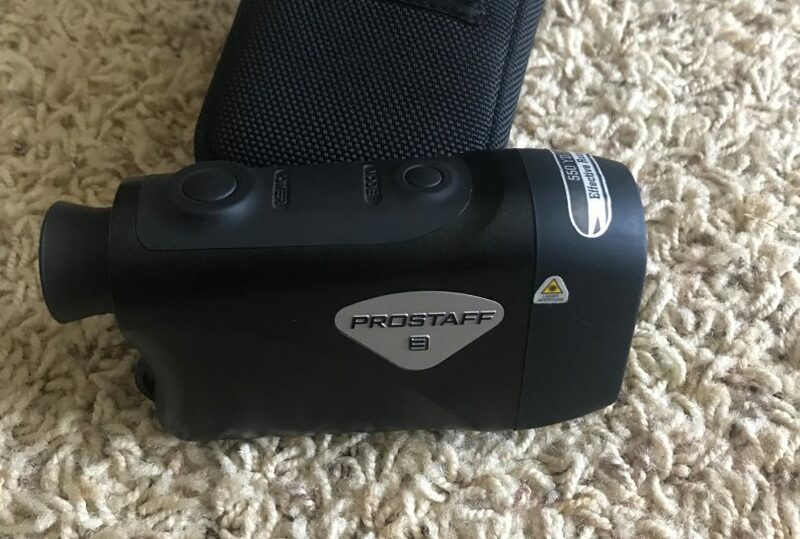 Besides these, other features of this rangefinder are good, which includes the single button operation, 6x magnification and its lightweight and ergonomic design. For durability, it comes with a nylon case and neck lanyard for portability. 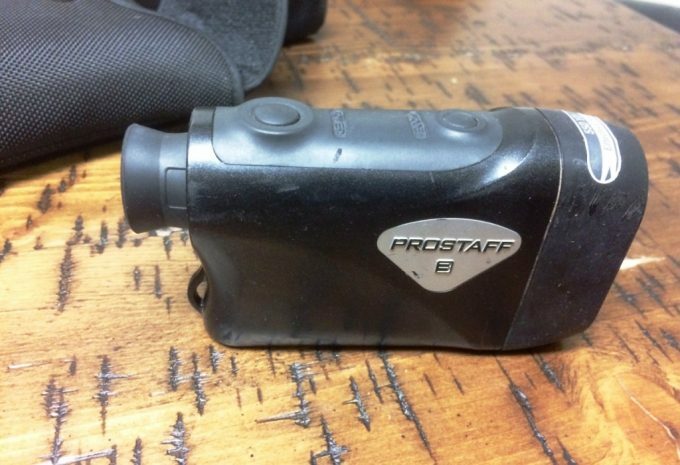 Rangefinders are an integral necessity of any hunting gear. Having it ascertains a high-level accuracy and utmost precision so finding the best rangefinder is a big deal. You will have to go through various features to achieve this. 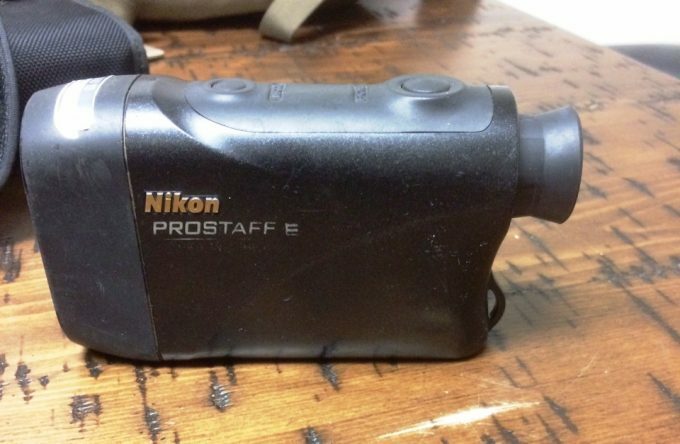 The Nikon Prostaff 3 is one the many finders with amazing features for hunters. Having this rangefinder provides for a clear, precise shot. This is provided for by the high-end features of this finder, which contrastingly comes at an affordable price tag. The water and fog proof nature provide reassurance of continuous hunting escapades regardless of the frequent light rains but keep in mind that the battery chamber isn’t rainproof. Therefore, you might want to have it covered in case you intend to use during such conditions. This will prevent imminent damage. The quick and accurate ranging to up to 550 yards is the other essential aspect. This implies that you can range up to 550 yards with ½ yard increments to 99.5 yards. This is made possible by the bright and multi-colored optics which are clearly displayed in the uncluttered LCD. Much can be said about this rangefinder, but as a hunter, you will certainly enjoy hunting with it. If you are unsure that this rangefinder will suit your needs, please go through the outline above. Amidst the world of many rangefinders present in the market, Nikon presents you the Nikon Prostaff 3. It is an intuitive, compact, reliable, durable and affordable rangefinder which doesn’t compromise much of its features for the price.It is feature packed, with great ranging abilities. It is a great addition not only to your hunting gear but can also work exceptionally well for distance measurement, even when golfing. If you find it convincing, consider giving it a try. Also, get back to us with some feedback about your experience with it in the comments section below.